The "OH MY GOD" Cupcake of your Dreams! Let me just preface you all by saying, I am not being dramatic, at all! This is The cupcake of your dreams, the “I can eat 5 of these” and the don’t feel guilty cupcake. Two years ago, I was in full swing of recipe testing and developing for our wedding cake. I knew that as a baker, I had to make my wedding cake or I really wouldn’t love what anyone else made for me. Everyday after my full time job, I would bring out my mixer, my cake pans and all the ingredients to perfect my vegan & gluten-free vanilla cake recipe! After about 3 months and 4 recipes, I created, the most delicious vanilla cake. I consider myself someone who loves chocolate and vanilla. My goal in the end of 2018 was to create the cupcake of your dreams. A chocolate cupcake that was sugar free, gluten-free, dairy free and drumroll please....low carb! On a sunny Saturday afternoon, I grabbed my trusty kitchenaid, a notebook and my apron and set to the kitchen. My timer buzzed, I pulled the first batch out of the oven, waited impatiently staring at the cupcakes for 15 minutes to be cool enough to remove from the cupcake tin and sliced my first cupcake in half to examine the texture. Not only were these deeply rich in chocolate flavor, but the texture was something that rivaled a 4 star restaurant chocolate cake. Full of air pockets, moist through the center, a firm top and a nice squish when you bit into it. These cupcakes were visually a work of art, and tasted like a devil’s food box cake mix. My house smelled like a bakery. The scent of chocolate and vanilla extract coated the air and I knew this recipe needed to be shared with the world! Let’s take a step back! How many of you have had a “gluten-free/healthy” treat that tastes like grass? Me! I have had so many bakery items that were health, vegan, gluten-free, nut free, sugar free, you name it and they all tend to be very disappointing. I do not skimp on flavor. Having dietary restrictions myself and living with celiac, I made it a point to myself, family and community of gluten-free eaters to never create a recipe that was “meh”. 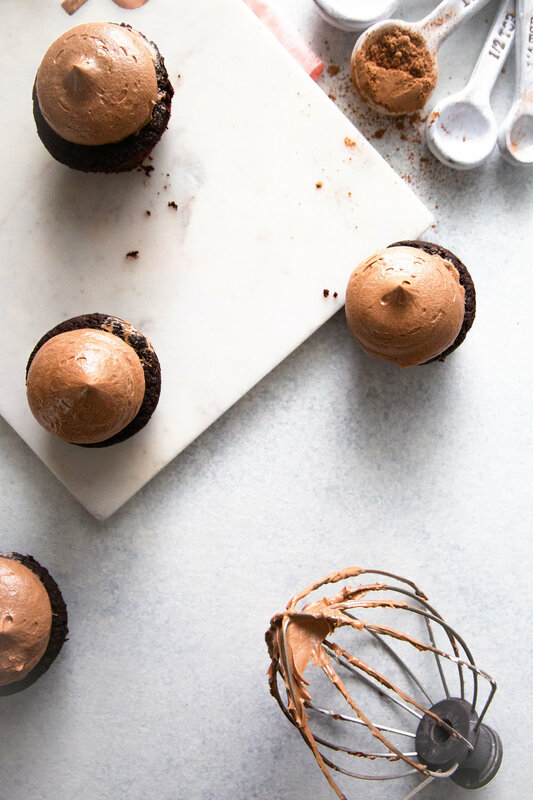 This recipe is truly the “OH MY GOD” Cupcake of your dreams! 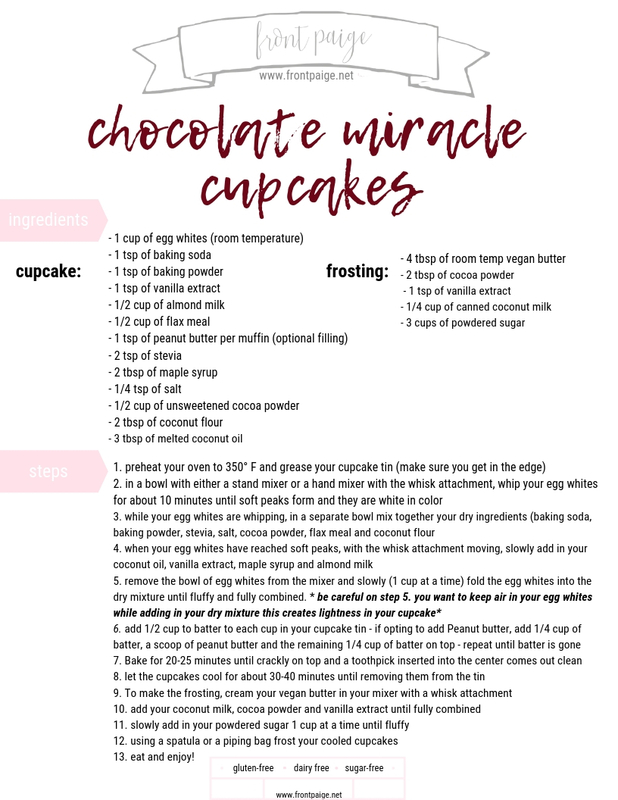 This recipe can be eaten as a chocolate muffin (without frosting) or as a cupcake for any occasion with frosting. Something that I find hard when making frosting healthy, is that you really do need a powdered sugar to help whip your vegan buttercream. Although, the cake itself in your cupcake is sugar free, a little frosting never hurt anyone! It’s simply the best of both worlds, healthy cake, rich, creamy, sweet frosting! If chosen to omit the frosting, these muffins are perfect for breakfast room temp, warmed up as an afternoon snack for tea or perfect for an after dinner indulgence! 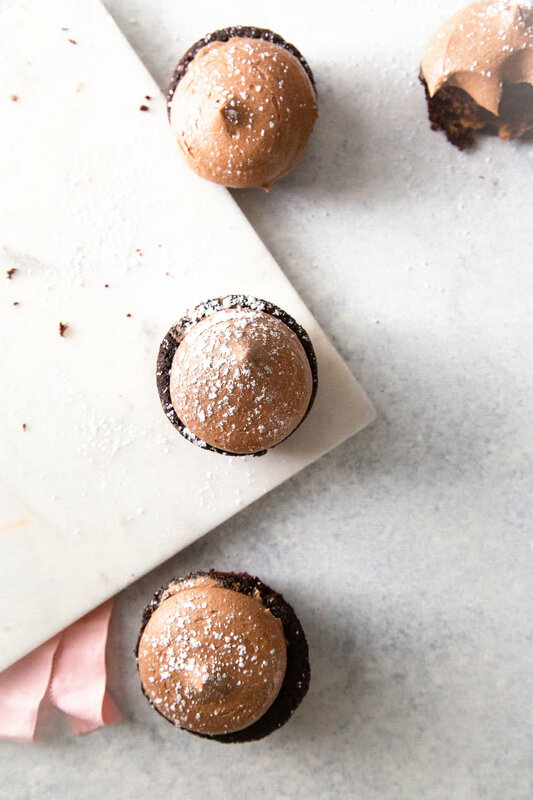 The goal with this recipe was to create a cupcake that was healthy, delicious and something you could bring to a party and surprise your friends with its flavor and health! If you guys make these, please tag me in your Instagram pictures so I can see your creations! Cheers to happy baking and a healthy life!